Trashpaddler's Waterway Wanderings: Mass. Bottle Bill Expansion Up Off the Canvas! 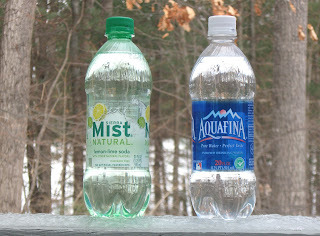 Though the two plastic containers pictured above are identical, one (carbonated) has a redemption value of 5 cents when empty whereas the other (not carbonated) is worthless when empty. Too many of those containers without a redemption value are ending up in the landfills, incinerators, or the environment. Numerous polls show that most folks find this situation to be just plain silly and lacking any common "cents". Thanks to the Massachusetts State Senate's recent approval of a bill which includes a provision for expanding the state's 30 year old bottle redemption program, it's now up to a 6-member legislative committee and Governor Deval Patrick to finally remedy this discrepancy. Of course Speaker of the House Robert DeLeo will, most likely, play a role in the bill's fate. I'm hoping he'll take a walk around his neighborhood and look into the nooks and crannies, rivers and streams, curbs and shrubbery, before deciding whether to aim his powerful thumb up or down. Your blog post just came up in my google alerts for the MA Bottle Bill. Thank-you for spreading the word and for the work that you do! Cheers! You're welcome Johna and thanks for dropping by. Hopefully many folks will contact their representatives and the Speaker.